Alive! 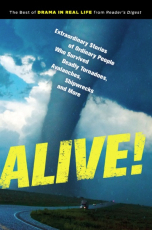 Extraordinary Stories of Ordinary People Who Survived Deadly Tornadoes, Avalanches, Shipwrecks and More! In "The Tot and the Twister," Derek Burnett tells the dramatic story of a grandmother's determination to protect three children when a tornado rips through her house. In "Terror on the Cliff," Kenneth Miller recounts hiker Larry Bishop's harrowing forty-eight hours clinging to the side of a mountain, thoughts of his wife and daughter giving him the courage to await help. And in "Face to Face with a Grizzly," Kathy Cook describes how two women who are being mauled by a bear summon all of their strength to defy death.